One of the games I loved playing with my students is a variation of I Spy. You know those books where you have to find an object among a mess of other objects? Well, there’s actually some incredible skills for students with autism to be had in these games! This post contains affiliate links. If you make purchases through these links, I may receive a small commission at no cost to you so thank you in advance! Full disclosure policy. 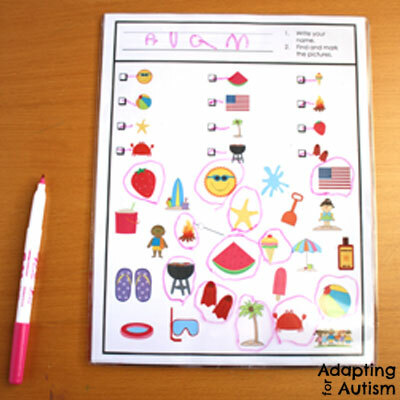 Visual skills are often considered a strength in students with autism and we fill our classrooms with visual aids. Yet, we also know that our kids can be quickly overstimulated by visual clutter. They can have a hard time identifying the important piece of information or get ‘stuck’ on details that should be filtered out. 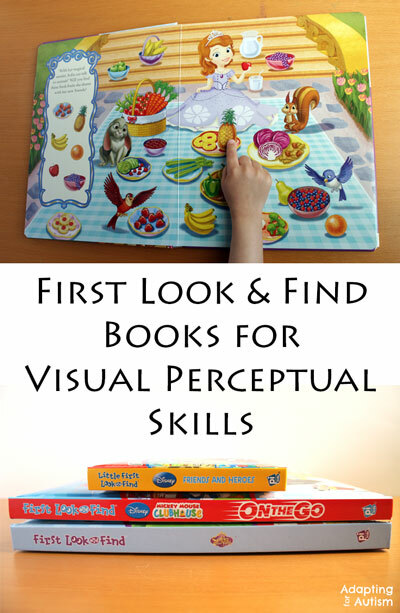 Visual perceptual skills help our students interpret what they see. And actively working on those skills can lead to improvements in other academic areas! Matching identical pictures is one of the first skills many students work on. We have file folders and tasks for days in our independent work stations, yet when I gave many of my students these games, they were lost. So while they could match pictures in a field of 20, a worksheet with a smaller field was too hard because the format was novel. These games help generalize their matching skills to a different form. Figure ground perception is the ability to identify an object separate from the background. I purchased some I Spy activities from the Goodwill but many of the I Spy books, puzzles and games contain objects on a cluttered background. Most of my students just weren’t quite ready for that much visual stimuli! So I made my own games with a clean white background. I made a variety of these games depending on theme I chose each week (I’ve linked 2 free ones at the end of this post – keep reading to grab them!). Because my students had a wide range of abilities, I always made 3 levels. Level 1 is for students who can match identical pictures using a visual key with no other distracting images. Level 2 is for students who can match identical pictures and need a visual key. Level 3 is for students who can read the items they should find. For those that are ready for a busier page, I highly suggest purchasing some First Look and Find books. Each 2 page spread contains pictures students must find within the page. And bonus – there’s a book for many of our students’ favorite characters! What’s more motivating than Pixar characters or Thomas the Train? Another benefit of these “Find it” type games is visual discrimination. Students need practice paying attention to the subtle differences between two pictures. Without strong visual discrimination skills, students may be unable to distinguish between letters (and thus words), numbers, coins etc. Being able to identify differences is the foundation of many academic skills! 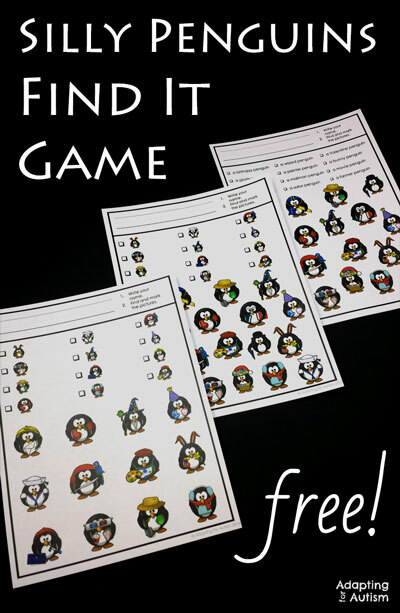 Some of my games have very similar pictures students must distinguish between – especially the free silly penguin game linked below. Each picture in the game is a penguin. The difference is what the penguin is wearing and holding. I’ve professed my love for these document sleeves in my “Stop Laminating Everything” post. Because we would play each game no more than once a year, I did not want to laminate them so I used the plastic sleeves and my kids used dry erase markers. Then I store the games in page protector in a binder with other activities for that theme. 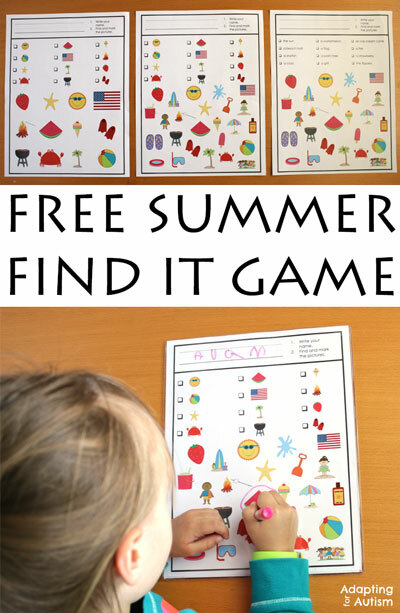 Here are 2 free games for you to try in your classroom. 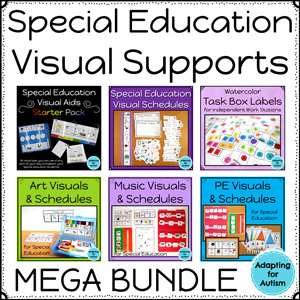 Click on the image to download them from my Teachers Pay Teachers store or pin these images for later!